Sudden cardiac arrest has very poor outcomes; less than 11% of patients in cardiac arrest in the Emergency Department survive to discharge from the hospital. The management of cardiac arrest is algorithmic because providers have limited tools at their disposal and limited knowledge of the patient’s past medical history. EKG is limited in its evaluation of cardiac function. Pulses are often difficult to palpate. The blood pressure cuff is often unreliable. As a result, there is a sense of futility when running resuscitations. 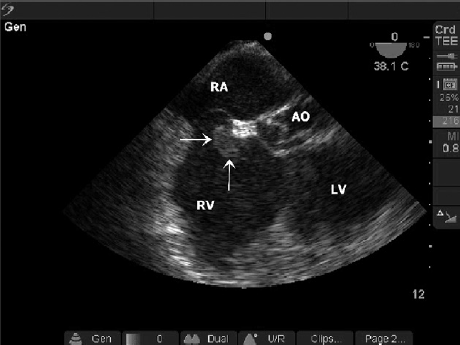 Transthoracic echocardiography (TTE) in the Emergency Department gave providers another tool to help guide management through direct visualization of cardiac activity, tamponade physiology, right heart strain, etc . It also offers prognostic value if there is no cardiac activity upon arrival to the Emergency Department on TTE, there is a near 0% chance of survival. However, TTE has its limitations: obesity, emphysema, poor windows, interrupts compressions, gel gets everywhere. Transesophageal echocardiography (TEE)provides significant benefits when compared to TTE in the management of cardiac arrest in the emergency department. Can transesophageal echocardiography change management in cardiac arrest in the emergency department? Six instances where TEE improved on bedside TTE: PICC line inserted too deep, aortic dissection, fine ventricular fibrillation, RA/RV thrombus, hyperkalemia with ventricular fibrillation, hypovolemia. In all 6 cases there was a change in management: PICC line removed, went to OR for aortic dissection surgery, shock delivered for fine ventricular fibrillation, tPA given for massive pulmonary embolism, hyperkalemia management given, volume and pressors started. TEE provides higher quality images than TTE, there is no need to stop compressions, the probe can be left in place without adjustment as the resuscitation goes on, the quality of compressions can be assessed in real time, subtle contractility and occult pathology is seen more easily, not affected by emphysema or body habitus, safety profile is excellent with exceedingly low rate of esophageal perforation, can cardiovert with the probe in place as it is electrically isolated. Expensive probe that takes time to insert, need gastric decompression, additional training is needed. There was only one emergency physician performing TEEs in this series. He is a renowned ultrasonographer, but the only training described is a “commercially available 2 h instructional DVD.” It is unclear how the 6 cases were chosen, when 15 were available to chose from overall. This case series was a proof of concept that clearly demonstrated six cases where cardiac arrest management was directly affected by TEE. This was a small cases series and it is not clear if there is a mortality benefit when applied to a larger population. However, the results are encouraging. There appear to be few drawbacks to inserting a TEE probe during cardiac arrest beyond training and the cost of the probe. The potential benefits are numerous, especially when applied to a person who is already dead. This article is >7 years old, however, TEE in the ED has yet to become wild-spread practice throughout emergency departments in the United States. However, there are specific programs where TEE is used regularly in the ED to help guide cardiopulmonary arrest management. No subsequent trials have been published to provide further evidence of its potential benefit. There are potential advantages to TEE use in the emergency department for patients presenting in cardiopulmonary arrest. Further research is needed to evaluate potential changes in outcomes as well as cost-effectiveness.